The Akakan Ski Resort area provides a variety of runs for all levels of skiers, from beginners to experts as well as a kids park. The best runs are on Akakura Champion if you are intermediate or better, but with more than 13 metres of snow annually, you’re guaranteed great skiing anywhere in this diverse ski area. This large, snowy area consists of two main ski areas where you can enjoy a four kilometre run from the top of the hill at 1,500-metre-plus. Or you can do whatever else fits your skills and interests: powder skiing, bumps, trees, terrain parks, or just plain cruising. At the foot of the resort is a small onsen resort area with a collection of restaurants, pension and shops. From the slopes a grand panorama spreads out, offering beautiful views of Lake Nojiri and, in the distance, the Sea of Japan. 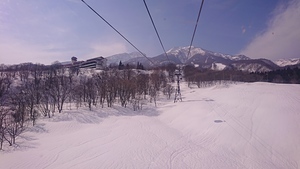 When combined with Akakura Kanko provides a good sized ski area with varied terrain. Snow usually very good with plenty powder in the side country and even on-piste after a good dump.